The is a Enhanced Definition Black Lens Tube with Lens for the ETC 36° Source Four Ellipsoidal Spotlight. 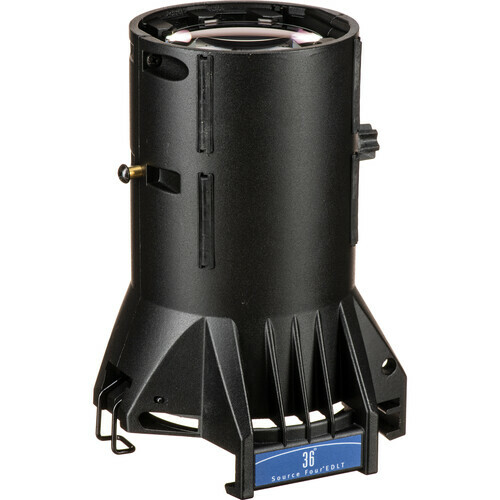 When a lighting situation requires even more precise optics for projecting images, gobos, and logos, the EDLT attaches easily to any new or existing fixed-focus Source 4 ellipsoidal spotlight. While increasing light output up to 10%, EDLT also provides heightened sharpness and stunning contrast to images when the Source 4 is used as a pattern projector. Fits all new and existing Source 4 fixture bodies. Available for 19, 26, 36, and 50° field angle models. Box Dimensions (LxWxH) 11.5 x 10.5 x 10.4"